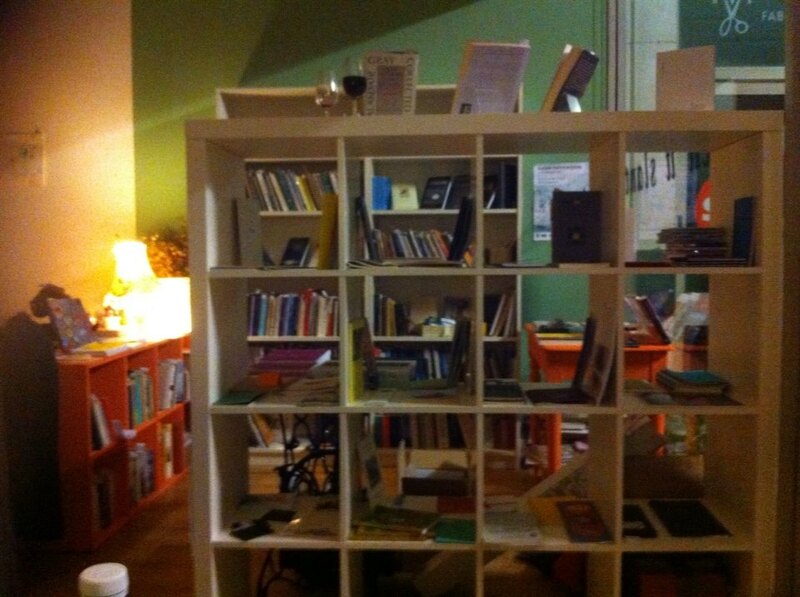 A lovely last night at tell it slant, our old poetry bookshop in The Project Cafe, now admirably run by Kathrine Sowerby, launching another Clydebuilt poet on his way with a first collection before I launch myself South and East across this island to work for The Poetry Trust. 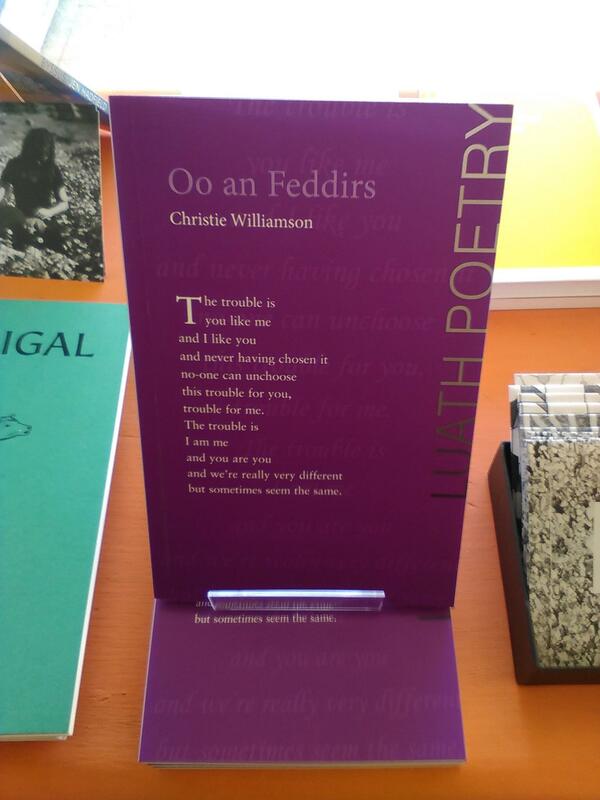 Christie Williamson‘s Oo an Feddirs, published by Luath Press, is a book I have been waiting for since I first heard Christie read at St Mungo’s Mirrorball five years ago. Christie with his long fair hair and strong Shetlandic voice seemed to come from another age, and his poems tangle Shetlandic Scots and English together in a weave so subtle as to be both intriguing and accessible – a rare pattern. “Oo” is Shetlandic for wool, while Feddirs can mean feathers or fathers. He speaks of the ambivalent nature of fatherhood, juggling boats for his son, and remembering “when someone else/was the clown/wishing he/was the child again.” He writes of his daughter’s first Carnival, music and dreams mingling “under her tuft of hair.” He speaks vividly of his passion for his partner Hazel Frew, herself an excellent poet, and literally writes her body as it writes on his. Being a weaver of voices by nature, Christie chose to interlace readings from the book with “a poyim or twa” from other poets who had helped him on his journey to this point, including myself, Kathrine, Jim Carruth, Cheryl Follon (whose new poems about Russia and love were an eye-opener!) and “da man who give me the best rejection letter of my life”, Gerry Cambridge, editor of Dark Horse magazine, who finished the night with a bit of music with a young singer songwriter he knew and some harmonica of course. Alexander Hutchison sadly arrived too late from another event to give us his traditional song at the end. But all in all, a lovely way to say farewell to the Glasgow “poyits” for now, though many of them will hopefully join me at future Aldeburgh Poetry Festivals once I get settled in… in the meantime, you can of course buy Christie’s book from tell it slant. * There is a very helpful glossary provided at the back of the book by Luath, from which these translations come: du/de– you; aa – all; hem – home; laet – late; bairn – child; oo – wool; feddirs – feathers (or fathers). 1 Response to Wool, words, feathers, fathers. Thanks Ellen. Really pleased with the event, the book – and your write up! Good luck in Aldeburgh!